← Can you imagine a life without cupcakes? Birthday biscuits – shortbread biscuits with rosette swirls. I’m a busy mum. As we head towards the end of each week, I’m surprised with the amount I am able to achieve, yet I sometimes still feel overwhelmed with what is still left on my to-do list. My eldest daughter turned 13 last month. To kick start her birthday celebrations, she wanted to give her classmates a sweet token…but without much warning for her mother. It’s Thursday afternoon and she waltzes in from school and requests 30 sweet somethings for the class. I have a cake order to fulfil, which she finds me decorating, when she arrives home (not to mention the items pending in my inbox). How do I keep my daughter happy and continue to fulfil my cake orders? 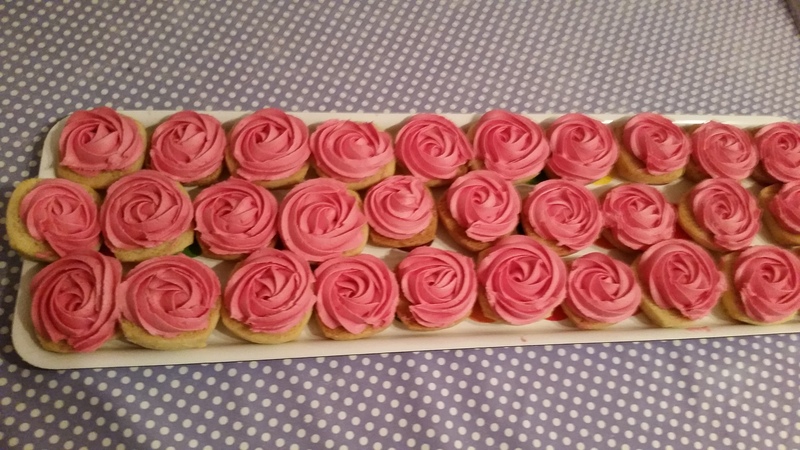 On Friday morning, I sent her off to school with a box of these mini shortbread biscuits, piped with soft buttercream roses and a smidgen of glitter. Her classmates loved them, simply because they were dainty and pretty (just like Jemimah). Job done! Space, peace and time for me, and Mummy bonus points to boot! I have a cake business called Delights by Cynthia. I blog about cakes, treats and all things sweet. This entry was posted in Bake, Baking, Birthday, Buttercream, Celebration, Daughters, Delights, Happy Birthday, Icing, Mother, Roses and tagged birthday, Biscuits, buttercream, cake decorating, class, dainty, decorating, glitter, mini, pretty, rosettes, school, sweet. Bookmark the permalink.